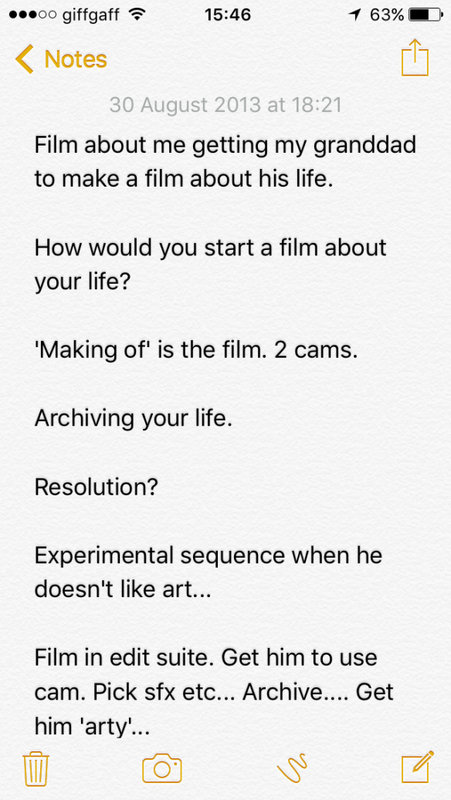 I had no idea it was still on my phone, or that it even existed in fact, but what it was, was the very first ideas for what would later become my first fully funded short film: Directed by Tweedie. I wanted to share this to prompt a larger post about how small and seemingly insignificant ideas can grow into funded projects and beyond. Reflecting back, over three years later, it strikes me that this very initial flurry of notes I took on my regular, mundane bus journey home one night is one of many others like it and something that I hope inspires others to be determined enough to pursue their ideas, no matter how small and rough they start out. So what happened to this iPhone note? So, of course, Directed by Tweedie developed past this early iPhone note scribble. I would note however, that whatever I meant when I wrote the phrase ‘get him ‘arty’..’ certainly didn’t happen, but the finished film isn’t a million miles away from this very first early note. What good came from it? Just 10 months after those initial notes the film premiered at Edinburgh International Film Festival. It then went on to screen at festivals all over the place allowing me to travel with it on occasion, such as to ZagrebDox in Croatia. The film also won me my first festival award at Glasgow Short Film Festival 2015, which carried a cash prize. 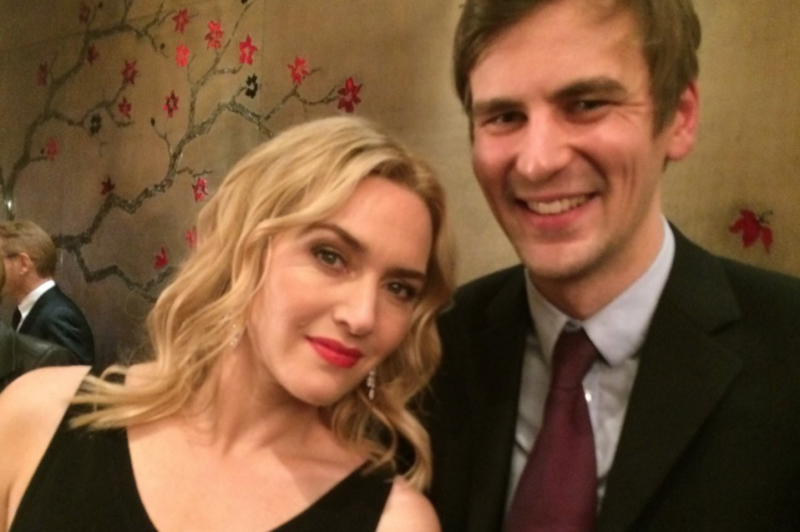 It even opened up an opportunity to meet Kate Winslet at the London Critics Awards 2016, which was … unexpected and probably what my Mum would call my career highlight to date. Plus, on a personal note, I got to spend a lot of of quality time with my Granddad. All of this would never have happened if I’d never acted upon a seemingly daft note I made on the bus. Take a look at your own notes right now, whether they’re on your phone, your old notebooks or wherever you scribble these little ideas down and rediscover your old imagination and all the lost ideas that never went anywhere. I have piles of them, lots of films that were never made and Directed by Tweedie could’ve been amongst them, but when you commit to an idea and see it through all sorts of exciting things can happen! The film is completed and has been released online, so is that it? Has it reached the end of its life? In some ways yes, however in mid-2016 another opportunity came up; to work with older residents in a care home in some kind of creative way. I decided to pitch to make an adapted version of Directed by Tweedie, where I would work with the residents of a care home to make films in a similar way to what I had done with my Granddad. The project was then accepted and commissioned by Luminate Scotland’s Creative Ageing Festival with the support of Scottish Care and I ended up spending 2-3 months in a care home making films with the residents. This might not be everyone’s cup of tea, but I had one of the best filmmaking experiences of my life. Working with the residents resulted in a series of five short films which have been screened at care home events and to people involved in the care sector across the UK. You can read more about Duncan’s new project Directed by North Merchiston and see the films here.